User Unfriendly by Vivian Vande Velde. ...when Arvin's mother gets a terrible headache that cannot be relieved by magic. When the game characters start looping, saying things over and over again. When the group of warriors, thieves, and magic users discover they cannot leave this game unless they play it successfully. Unfortunately, that means they have to rescue Princess Dorinda from who-knows-what in who-knows-where. That is, if they were meant to save her after all. They might be led to another path, which they eventually have to take. Who knows? Meanwhile, Arvin's mother is slowly fading away, and might eventually disappear. Along their path, the group encounters a werwolf, goblins, orcs, sand hands, a stone troll, and a shape shifter. How will they solve this problem, and how did it come to be a problem in the first place? Really want to know? Read User Unfriendly yourself to find out. I think this is a great book, with an incredible and slightly complicated plot. This is such an intriguing problem that needs to be solved, and the technology that painted the setting is just spectacular. The setting is more than a reader can ask for. It's this amazing countryside that gets you on the edge like, is that it? But then your blown away, because it's not just the countryside, it's the town in which if you leave, you cannot get back! I rate User Unfriendly 4.99 stars out of five stars. Not only is this book completely mind blowing, but Velde used such great terms to describe the settings! However, I feel that she didn't describe the characters enough. That is, because I had a difficult time visualizing the characters as I read. Did Arvin's character have a beard? Did Princess Dorinda have a lean body? Was Arvin's mother plump? Perhaps Shelton's a stubby little character. Or maybe his character always wears a bathrobe. I don't know, and I'd like to find out. It would be more reassuring for me to know what the characters looked like. However, all in all, this not only one of my new favorites, it's also a great book to read, and I advise you to read it, especially if you enjoy adventurous fun books. We would like to thank Houghton Mifflin Harcourt for providing a copy of User Unfriendly for this review. 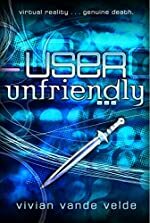 Have you read User Unfriendly? How would you rate it?